Picturing Disney: A Conversation With Mufasa: Alton Fitzgerald White discusses his new book "My Pride- Mastering LIfe's Daily Performance"
A Conversation With Mufasa: Alton Fitzgerald White discusses his new book "My Pride- Mastering LIfe's Daily Performance"
Life hands you gifts all the time. Sometimes you run with them. Other times you are so busy or out of tune with yourself that these little gems go unnoticed. 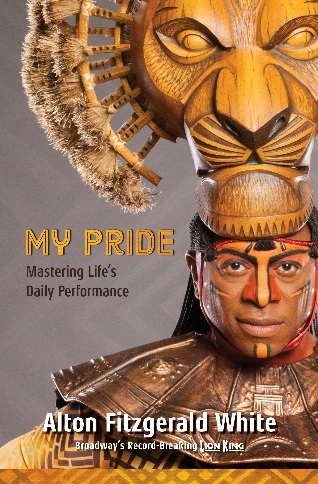 My Pride: Mastering Life's Daily Performance by Alton Fitzgerald White is one of those gifts. Everyone should read this book. Anyone who has ever dreamt of their possibilities or doubted their abilities could benefit from Alton's experience. My Pride is the story of how a young boy defied the odds and grew up to become the longest running Mufasa on Broadway. My Pride is at heart a book about hope and potential. I read the book in two days. It is that good. My Pride is conversational. The book reads as if Alton is a friend over for coffee. I felt like I knew him personally as I turned each page. Alton's voice is what makes the book so special. The world knew that Alton is blessed with the singing voice of an angel but in My Pride Alton the leader gets his chance to roar. I was recently given the opportunity to sit down and chat with Alton. Remember those gifts from life I mentioned earlier? Always keep yourself open to the possibilities. Alton Fitzgerald White is exactly who you think he is when you read his words on paper. There are no pretensions about him. After a record breaking 4,000 performances as Mufasa he is as level headed as one can be. We met at a coffee shop near Lincoln Center in New York City and the conversation flowed so well that our time together seemed over in an instant. In writing My Pride Alton was inspired to share his vision of service. "Service is simply the gift of discipline that you give yourself." Alton maintains that when you harness discipline you tap into the hope that lives deep within yourself. By taking responsibility for your actions and finding joy in everyday achievements you can live each day with pride and a sense of achievement. You basically take luck out of the equation and build yourself up to flourish. You nurture your true talents. Success isn't a function of luck. It is the result of discipline. Success isn't about fame or riches, it is about living up to your own true potential. Alton would love it if everyone could work towards tapping into the Mufasa within themselves. He spoke about how Mufasa represents leadership. "Mufasa is fair, balanced and tough yet compassionate. He is the combination of many things much like yin and yang". He may not have realized it as a young boy but Alton, like Mufasa is a fine example of leadership. It takes courage to step out of your comfort zone and go after your dreams full force. My favorite lesson from the book is that "Everyone faces challenges in life, and the mark of character is how you respond to them." I asked Alton what his next act will be. Of course he is going to continue to entertain but he is also ready to challenge himself in other ways. He would like to bring his message of service to underprivileged kids. He will also be embarking on a speaking engagement tour and performing at the Festival of the Arts at Walt Disney World in February. I could see the spark of a new book forming in his mind as he spoke and I personally can't wait to read the next chapters. First premiering on Broadway November 13, 1997, Disney’s award-winning “Best Musical” The Lion King will celebrate its 20th anniversary this November! Now a veteran actor to the musical, Alton Fitzgerald White—the longest running “Mufasa”—reflects on his own life, career, and the rich lore of The Lion King, in MY PRIDE: MASTERING LIFE’S DAILY PERFORMANCE (Disney Editions | On Sale: November 7, 2017). In MY PRIDE: MASTERING LIFE’S DAILY PERFORMANCE, reader’s learn of White’s journey from his boyhood home in a Cincinnati housing project to the grandeur of Broadway's Minskoff Theatre, which is as remarkable and touching, as it is relatable; his struggles with feelings of inferiority; how he doggedly tried out for role after role and happily accepted whatever was offered to him, however modest, approaching each with passion and dedication. White’s gifts were ultimately recognized and rewarded with major roles including Broadway’s longest running “Mufasa,” having achieved a record-breaking 4,308 performances in this role. If you've ever wondered how an actor can perform the same role thousands of times (6 days a week, often twice a day, and sometimes even multiple Broadway shows in one day) without burning out, MY PRIDE tells the inspiring story of a humble “lion king” who’s done so with unabated joy and renewal of purpose. ALTON FITZGERALD WHITE is the only African-American actor who has played the lead role in five hit shows on Broadway, including John in Miss Saigon; Ken in Smokey Joe's Cafe (he originated the role in London's West End); Coalhouse Walker Jr. in Ragtime: The Musical; Mister in Oprah Winfrey’s The Color Purple; and King Mufasa in The Lion King. Visit Alton at his website: www.altonfitzgeraldwhite.com, or on Twitter @WhiteAlton. * I was provided a copy of "My Pride: Mastering Life's Daily Performance" from the publisher. In MY PRIDE: MASTERING LIFE’S DAILY PERFORMANCE, reader’s learn of White’s journey from his boyhood home in a Cincinnati housing project to the grandeur of Broadway’s Minskoff Theatre, which is as remarkable and touching, as it is relatable; his struggles with feelings of inferiority; how he doggedly tried out for role after role and happily accepted whatever was offered to him, however modest, approaching each with passion and dedication. White’s gifts were ultimately recognized and rewarded with major roles including Broadway’s longest running “Mufasa,” having achieved a record-breaking 4,308 performances in this role. 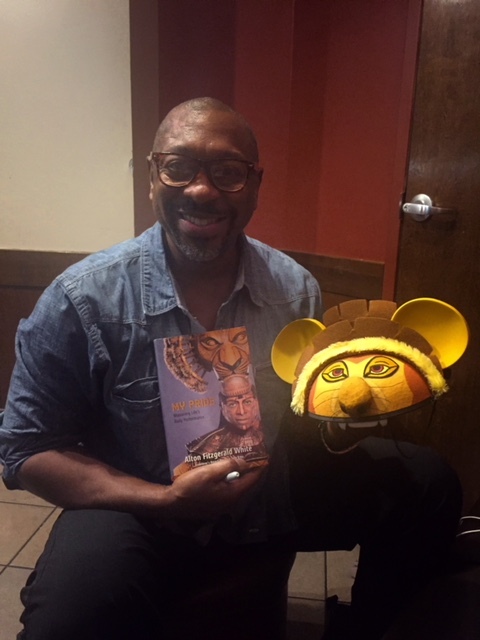 If you’ve ever wondered how an actor can perform the same role thousands of times (6 days a week, often twice a day, and sometimes even multiple Broadway shows in one day) without burning out, MY PRIDE tells the inspiring story of a humble “lion king” who’s done so with unabated joy and renewal of purpose. ALTON FITZGERALD WHITE is the only African-American actor who has played the lead role in five hit shows on Broadway, including John in Miss Saigon; Ken in Smokey Joe’s Cafe (he originated the role in London’s West End); Coalhouse Walker Jr. in Ragtime: The Musical; Mister in Oprah Winfrey’s The Color Purple; and King Mufasa in The Lion King. Visit him at his website: www.altonfitzgeraldwhite.com, or on Twitter @WhiteAlton. I received a copy of this book for review purposes. No other compensation was received. All opinions are my own. I had the great pleasure of seeing Alton perform in The Lion King. He was incredible and I was very moved by his performance! The book sounds amazing and Alton seems like an awesome human being. Can't wait to read it. Thanks for sharing this. I am so glad you got to see him perform! He is a true talent. Alton has incredible talent. I haven't read My Pride yet. I'm putting it on my reading list! It is very motivational you will not be disappointed. What a great-sounding book! I especially love the subtitle, "Mastering Life's Daily Performance!" (SO true) - sounds like an inspiring story and great read, indeed! Yes! The title is perfect for the message. Sounds like a great book by an amazing person! I will have to check it out. Thanks! I hope you will find the time to read it.